I don't usually have a problem waiting in line at a fast food restaurant or in the checkout line of a store, but there's a special place in Hell reserved for folks like this who run through the self-checkout with three carts full of groceries. 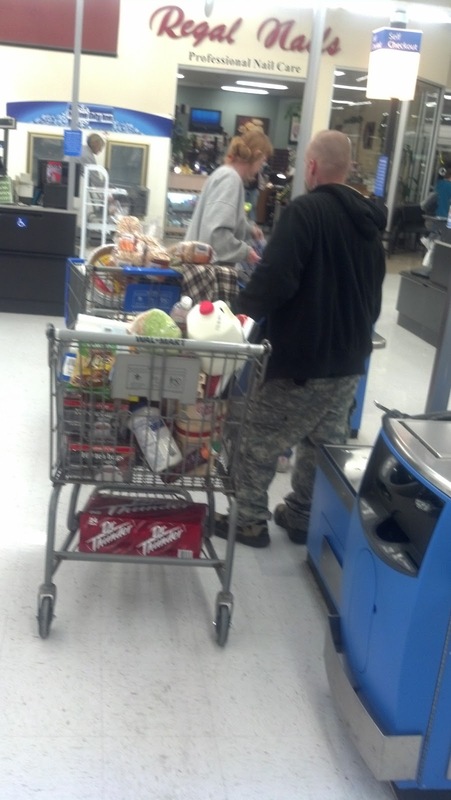 I nearly lost my cool when I was running through Wal-Mart with three items in my hands while these two sub-humans were carting a stockpile of coffee, creamer, teabags and other nutritional staples through the self-checkout. Wal-Mart policy, I'm told, dictates that no employee shall turn away a customer from a checkout lane for going over the posted item limit. This includes the self-checkout (although there's no posted limit on the Wal-Mart self checkout). And this is a small part of the reason why the rules of civility have been breaking down: because people are coddled so much that they expect that the rules do not apply to them. Because the customer is always right. Now, don't get me wrong. I'm guilty on occasion of running 25 items through the express lane from time-to-time. And, while I may think it's bad form and quite possibly suspicious to use the self-checkout aisle for more than, say 10 items, there's no law saying that I have to get in line behind these idiots. Certainly, a skilled person can zip through a self-checkout aisle if they know what they're doing. However, I get the feeling that these two would spend a good three minutes just wondering where the bar code was on a single tomato. The Camo Pants Say "Let's Do Lunch", But The Hoodie Jacket Says "You're Buyin'"